Opencart Marketplace Vendor Attribute Manager : Opencart Marketplace Vendor Attribute Manager is an awesome add-on for Opencart Marketplace which allows the admin to create custom fields on the vendor/seller registration form. This module provides separate registration field for the vendors/ sellers in the Marketplace. With the help of this add-on, vendor will have their own separate registration option on the login page on Account layout. Admin can create or update Vendor’s/seller’s custom registration fields. Vendor’s/Seller’s custom fields visibility depends on Admin. Admin can create different types of custom registration fields for Vendor/seller. Admin can set the registration field sequence as per their requirement. On the login/registration page, one can see separate registration option for the sellers/vendors and for the customer. Admin can create unlimited custom fields for Vendor/seller. The seller can add KYC documents with identity documents and proofs like Company documents and verification. Admin can enable the module. Admin will select various registration fields which will be displayed on the vendor Registration form. Admin will also set the sequence of the registration fields which will be displayed on the front-end. Admin will set terms & condition, which the seller will agree at the time of registration. After the admin configuration, user can see separate registration option- one for sellers and one for customer. Sellers can continue with Seller registration block and normal customer can opt for Customer registration block. On the Seller registration page, custom fields set by the admin will be displayed and it will be in the same sequence as set by the admin. There will be two separate registration blocks on the front-end. On the Seller registration page, custom fields set by the admin will be displayed. 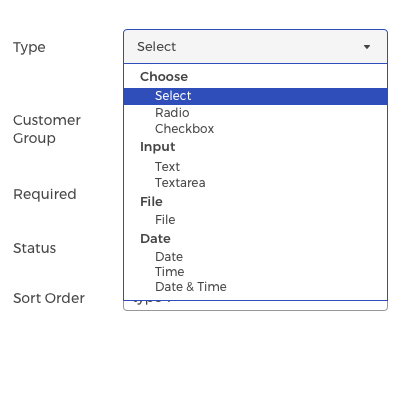 The admin must have hands on at all the input types for creating the custom fields for the seller registration page.This might include the ones which can be selected like checkbox & radio-button, for input like Text & Text area, for file attachment, to enter date & time. This is a technology-based era where everything is simplified even online shopping. We all know about shopping apps and its advantages-how it reduces and makes our shopping experience hassle proof. So it is very important for all the Store owner to have a shopping app for providing a more convenient way to shop from their online store and now Webkul has launched its new app Opencart Marketplace Mobile App. Did you buy Opencart Marketplace Vendor Attribute Manager? This is my 2nd extension purchased from webkul. The support is still of quality. I'm looking forward to work on the next extension from webkul. Thanks again.